San Francisco linebacker Reuben Foster allegedly threw his ex-girlfriend’s dog across a room during a domestic incident in February. 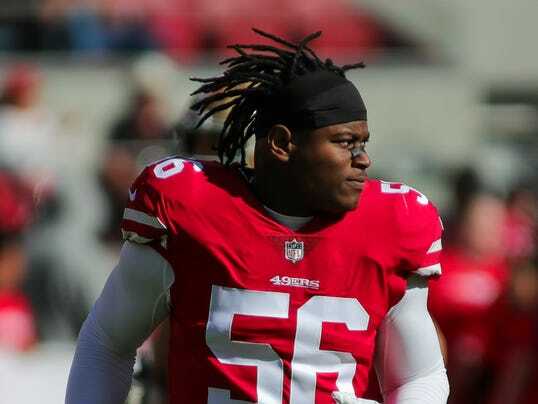 San Francisco 49ers linebacker Reuben Foster allegedly threw a dog across a room during an alleged domestic violence incident, according to a published report on Monday. The dog wasn’t injured in the purported toss, which occurred hours before his longtime girlfriend — who has since recanted the allegations of abuse — called Los Gatos, Calif., police, The Sacramento Bee reported. Foster was charged with domestic violence, forcefully attempting to dissuade a witness and possession of an assault weapon – all felonies – and is scheduled to appear in a San Jose courtroom on Tuesday. Foster was not charged with animal abuse. The alleged victim suffered multiple bruises and a ruptured ear drum in the alleged Feb. 11 incident, although her lawyer said she lied about what occurred. She originally told police that she was thrown out of the residence three times during the course of an argument, The Sacramento Bee reported. The alleged victim said she was struck about 10 times “hard, but not that hard” by Foster. The officers who responded detected the strong smell of marijuana when they entered the residence. The alleged victim told police that Foster threw her clothes out the window from an upstairs room and demanded she get out of the residence. She also said that Foster dragged her downstairs by the hair and threw her out and locked the door, according to the newspaper.